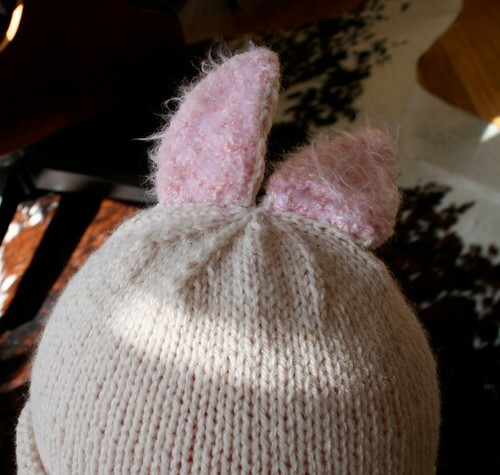 Really, is there anything cuter than a little kid in floppy bunny ears? No. So here is a pattern to help make that oh-so cute spring scene come true. Enjoy! I hope you find lots of chocolate! Click to download a pdf of the Bunny Hat Pattern. Pink yarn is Sensations Angel Hair Boucle in color 4348, (or Pink) . Size 6 Double pointed needles or size needed to get gauge. A quick discussion about gauge.The yarn suggests that you use an 8 and get 18 stitches over 4 inches. I like a tight knit. I used a size 6 needle and got 5 stitches per inch. I didn’t even measure the gauge for the pink yarn. It is so fluffy that I just went with it. This should fit a 1-3 year old. Here is a link to a neat site that has lots of helpful measurements. Here is the hat page. Note: This is a simple roll brim hat. If you already have a hat pattern you are comfortable with, you are welcome to substitute that in here. The hat is not the magic here, the ears are. Cast on 78 stitches. Join- being careful not to twist the stitches, and knit in the round. Put a stitch marker between the first and last stitch to mark the beginning of a new round. 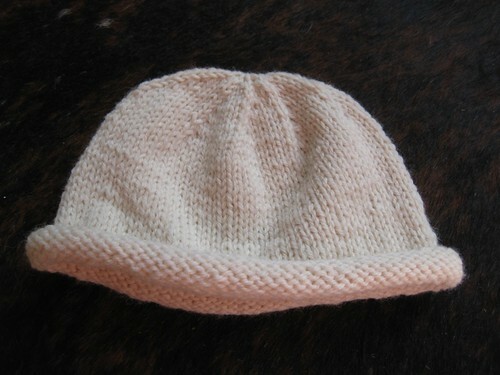 Knit until the hat is about 4.5 inches with the brim rolled. Begin decreases on the next round. Knit 6, k2tog all the way around. Cut yarn leaving a long tail (12 – 18 inches). Thread the needle, and carefully run the yarn through all the remaining stitches. (I like to run the yarn through twice. It closes the hole nicely.) Then weave in the tail in the top of the hat. Cast on 10 stitches in white and then, on the same needle cast on 8 stitches in pink. 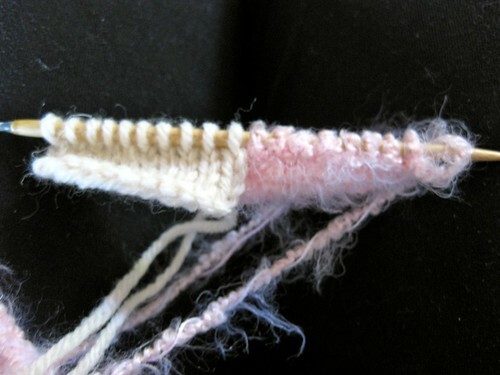 Purl the 8 pink stitches, twist the pink yarn and the white yarn, then knit the 10 white stitches. Turn. 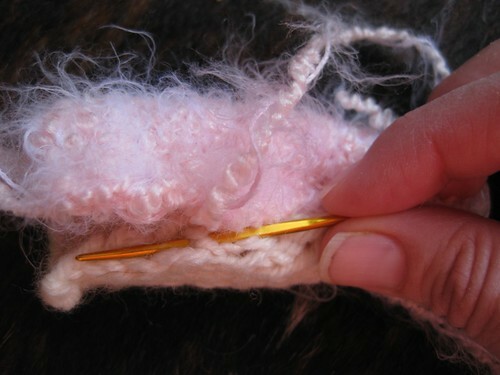 Purl the 10 white stitches, twist the pink and white yarn, then knit the 8 pink stitches. Continue in this way for 12 rows. 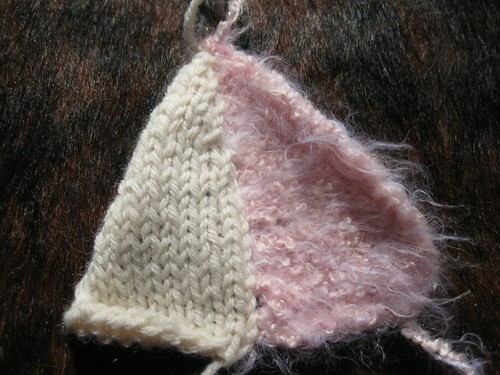 You are creating a stockinette white side and a reverse stockinette pink side. 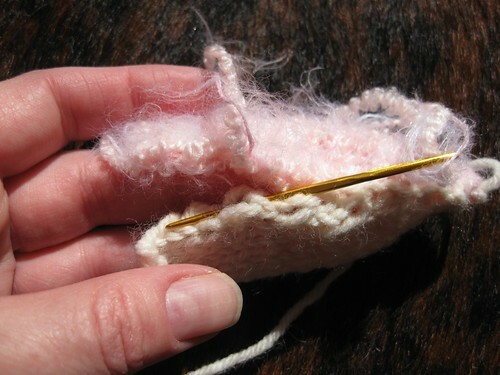 Be careful to always twist the white and pink yarn together where they meet in the middle so you will not have a gap. Row 13: (white knit row), k2tog, knit 6, K2tog, twist white and pink. P2tog, P4, p2tog. R0w 14: do not decrease. Row 15: (white knit side) k2tog, k4, k2tog, twist yarn, P2tog, P 2, P2tog. Row 17: (white knit side) k2tog, k2, k2tog, twist yarn, P2tog, P2tog. Row 19: (white knit side) k2tog, k2tog, twist yarn, P2tog. Row 21: (white knit side) k2tog, twist yarn, P.
Cast off the final stitches. Leave about 12 inches of pink tail to seam the side with. Fold the ear in half. The pink will be the inside of ear. 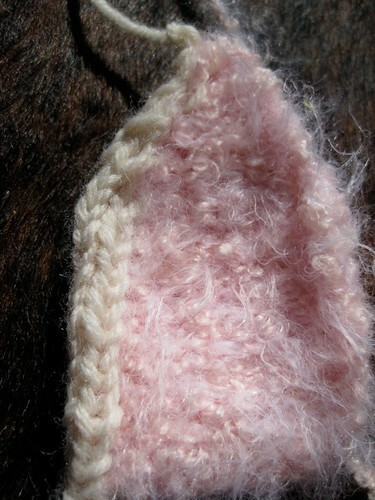 Using the pink yarn, seam up the open side of the ear. (if you don’t love seaming, this is for you! the pink fluffy yarn hides a multitude of imperfections. 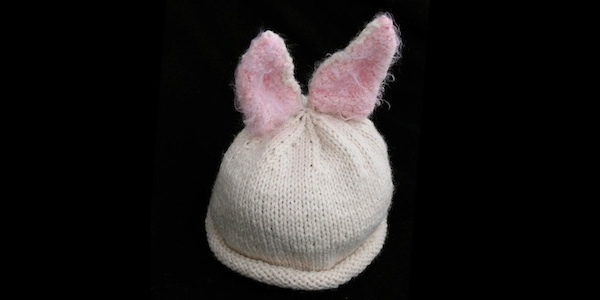 Attach the ears onto the hat with white yarn. The placement of the ears is a little bit subjective. But I can offer, they need to be close together, and just slightly forward of the center top of the hat. Here is how they look on top of a head. This is a really quick project to knit up. You could definitely get one cranked out for Easter. If you have any questions, feel free to shout them out! If you find any errors in this pattern please let me know so I can correct them. 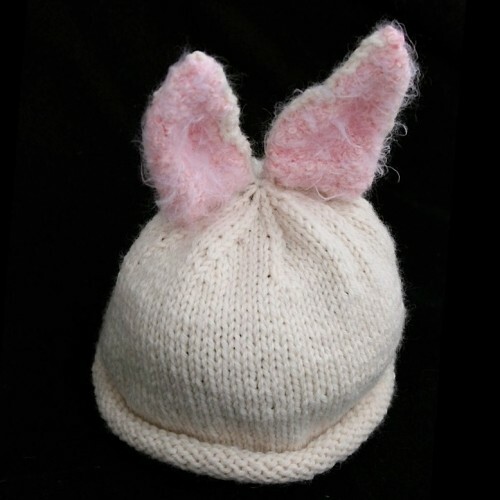 7 years ago by Susi in Easter , Holiday , Knitting , Knitting Projects , Needlecraft , Projects | You can follow any responses to this entry through the RSS feed. You can leave a response, or trackback from your own site. Cathy, Let me try to make this part clear. 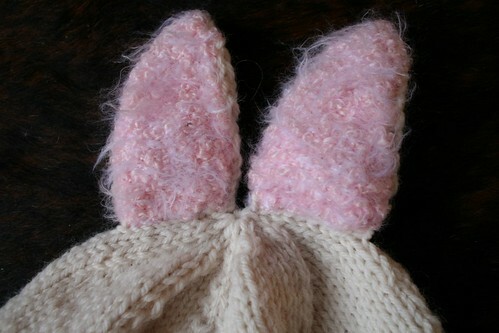 The ears are knit in stockinette. The White part is knit side out, and the pink side is purl side out. I give the directions row by row. For 12 rows, there are no decreases. Then, row by row, the decreases are done (in the pink and the white) and then the ear is seamed. If you are using the fuzzy pink yarn, the distinction will not be that clear, because the boucle and fuzz will hide almost all stitch definition. Does that help to clarify? Do you have a video on how to do the ears? No, I’m sorry we just have the pictures of how it is done that are above. When you are twisting the yarns it looks like you are twisting four strands of yarn. The cast on tails and the working yarns. Sue Ann, I believe that I only twisted the working yarns. The tails I saved and if they are long enough, can be used to sew the ears onto the hat. I’m starting my decreases and I think the number of cast on stitches(78) is wrong—doesn’t it have to be divisible by 8? What am I doing wrong?